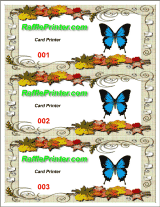 You can print different images on each of the items, perhaps for different sponsors, event members, special recipients, or just to randomly vary the appearance of each item. Select 'Multi Image Demo' from the Pre-Sets drop-down to auto load an example and click to cycle through images. To multi-select images, after you click Multi Images, in the File Selection Dialog, click on the first image, hold down the Ctrl key (lower left keyboard) and click on all the images to include. Click Open and the animation will display in the designer. Left click and drag to position the images. Click to cycle through the selected images. 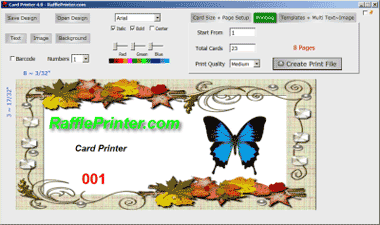 To see how they will be printed on the cards, Tickets etc, create a demo print file, open in IE and inspect individual items and pages. If you have matching Individual Names (Personalized Cards) and Individual Images, when you mouse over the Name Count, the images will cycle through with the Names, so you can check they match. The Names are displayed in the order they are listed in the text file and the images in the order they were selected. You may have to re-name the images so they appear in the correct (alphabetical) order to match the Names. To see how it works, select 'Multi Image Demo' and then 'Fortune Cookie Quotes' from the Pre-Sets drop-down and mouse over the Name Count label to cycle through images and quotes (names).